On the surface, Marley & Me (being released Christmas Day by Fox 2000 Pictures) is a wacky comedy about the world’s worst dog, but ultimately it’s a thoughtful journey through life. Based on the best-selling memoir by John Grogan, Marley & Me follows John (Owen Wilson), his wife Jenny (Jennifer Aniston) and their relationship with a rambunctious golden lab named Marley. In a story spanning 15 years, the film wrestles with such themes as marriage, children, career and mortality. In this free video tutorial, brought to you with the support of Waves, we show you a very simple way of injecting some instant attitude into your reverb effects. Break free from the comfort of natural sounding reverbs, experiment with this creative technique as the results are explosive. In 2018, John Likens explained to us the work of Method Studios on the opening and end titles sequences of DEADPOOL 2. He talks to us today about his work on the main title sequence of WARRIOR. Blackmagic Design's Technical Sales Director, Craig Heffernan, takes us through some of the new features in both Resolve 16 and the recently announced URSA Mini Pro G2 Camera on the NAB2019 showfloor. With software suites continually offering an expanded toolsets and features, it can be easy to overlook the foundations of what makes a good edit. 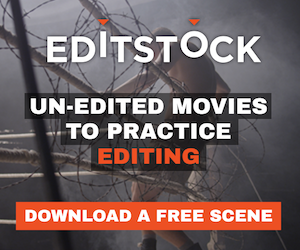 A good edit tells a story, a good edit has rhythm, and a good edit is invisible. No amount of visual trickery will disguise a bad cut and advances in hover-scrub technology will not correct poor rhythm and visual discontinuity. As it became clear at the weekend at the Middle East Film and Comic Con, the appetite for all things in the Marvel Cinematic Universe shows no sign of abating, handy since the release of Avengers: Endgame is around the corner. At this moment in time, post-production workflows are moving towards single-application solutions. FXHome’s HitFilm Pro 12 is one of those full-suite applications making collaboration in one single software possible. An all-in-one editor, compositor, and VFX suite with audio editing and color grading capabilities built in as well, HitFilm Pro 12 should be considered for your next motion graphics-heavy project. We take a look at several of its key features in this review. About 1600 companies exhibited at NAB 2019, and with almost 1300 people registered as press there were almost enough journalists around to permanently assign one of them to every booth on the show floor. In a new format we are producing videos offering tips and solutions to common problems in under a minute. In this free video tutorial we show you how easy it is to set up side chain compression in Pro Tools. I’m one of those people who still buys DVDs for the exclusive featurettes. Oftentimes good, sometimes great, those making-of docos don’t always have time to dive into the nitty-gritty of how a film was crafted by scores of artists coming together.